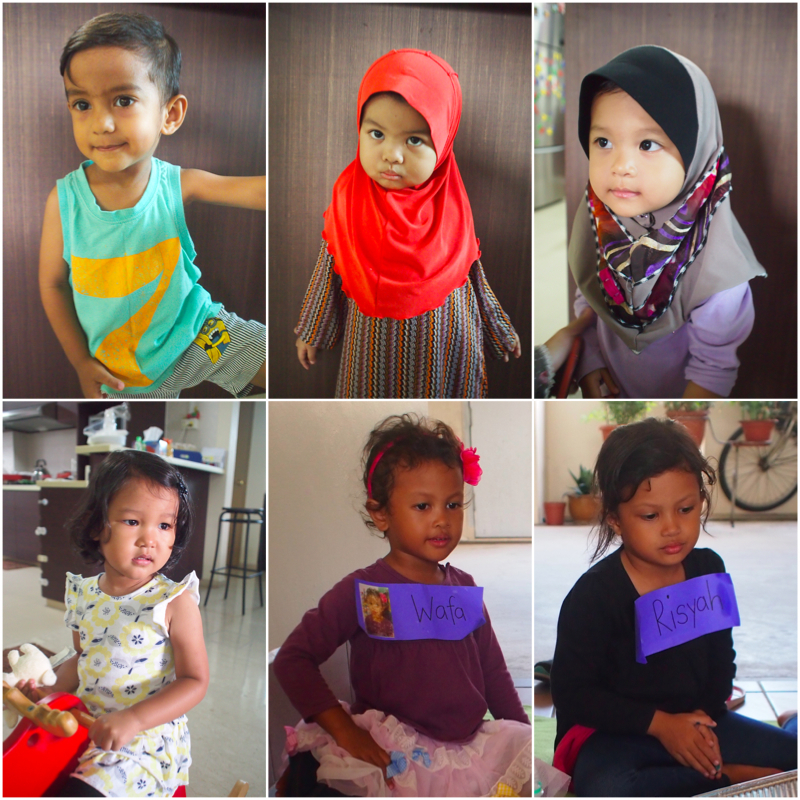 A couple of my friends know that I plan to conduct Science Playdates regularly once Umar turned 4. But little did I expect that my plans would be a step closer to reality sooner than I expected. I was excited when a couple of mommy friends expressed interest that they would attend a session. 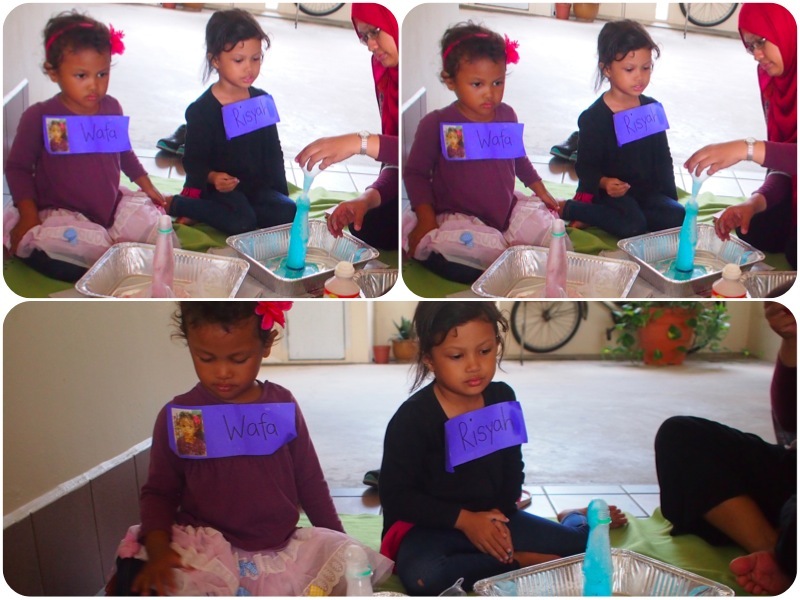 I thought hard and decided to hold my very first Science Playdate. The theme for the first ever Science Playdate was COLOURS and the details were posted here initially. Since I was expecting a set of very young participants, I decided to have apparatus that are easy to handle and chemicals that are safe for them to be in contact with, should there be any spillage. For a start, all the chemicals are mainly kitchen ingredients. The rationale is simple – they can replicate it at home in different ways at any point of time. When I announced the details, I was surprised by the interest shown. I thought nobody would be interested. I got really nervous as I was afraid I could not live up to expectations. 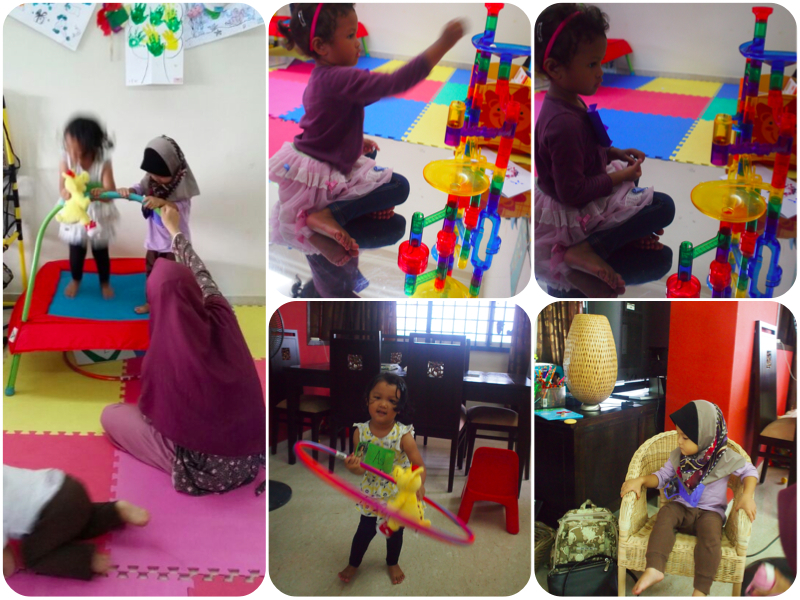 Several other mommies have hosted playdates before and WOW! they certainly have set the benchmark way too high with ample snacks for both adults and kids and the engaging activities! I had so much fear in me that I wanted to call it off actually. Plus, I was being over-ambitious in the days before the event. I had lined up activities and even squeeze a short family holiday just to make sure I made full use of the one-week school break. Umar trying out the dispersion of protein in the milk by the detergent. He was enthralled by it that we sat on the activity for a good 20-30 minutes or so. Umar really loves his lava lamp. It looked better when we played with it on his light table. If you noticed, the contents of the lava lamp spilled because I did not leave 1/4 of the bottle free for the carbon dioxide gas to accumulate. Buying the apparatus was simple. I made sure most of the items are recyclables so at least I can reuse them over and over again. Two days before the playdate, I packed all the materials in bags so I would not be a headless goose finding random items in the midst of it all (although I did at some point, causing me to break out in cold sweats). The night before I managed to whipped up a decent pasta dish as snack for the mommies. I had intended to use my pretty porcelain baking dish for the longest time but did not have a chance to. Without much cooking experience, I was glad the dish turned out alright and both mommies and kids enjoyed them. The karipap was tasty. I am not a fan of karipap but the filling is really appetizing! Thanks Nad. The day of the playdate came and I was a nervous wreck. I still had a couple of things not done such as his play area and the oreo oats cookies that I had planned to bake for the kids. Luckily enough they came a bit later so my darling little elf, Umar, helped me to whip up the oreo oats cookies. 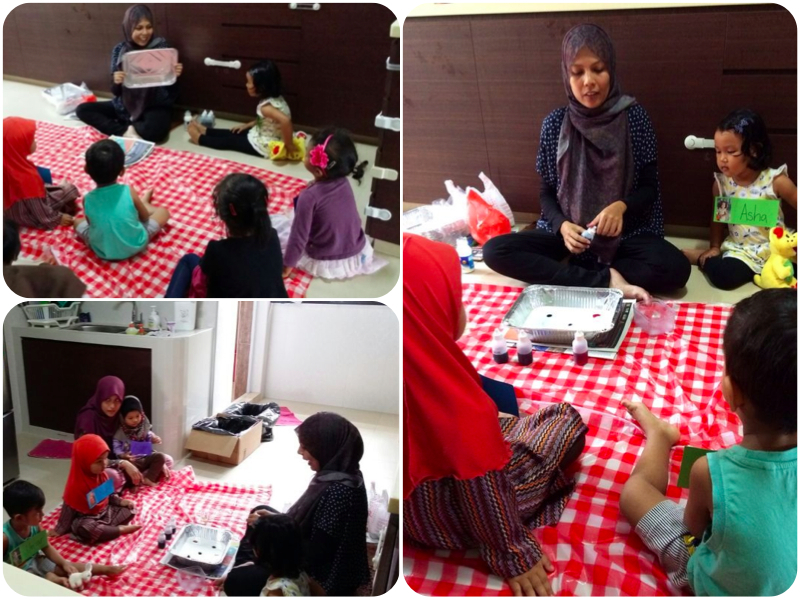 With Bismillahirrahmanirrahim and a deeeeeeeep breathe, our Science Playdate started. I had printed a personalised name tag for each one of them to help me identify them. Not that I cannot remember their names but it gave me comfort and was a form of ice-breaker for them. After free-play, we started with ice-breaker activities that involved everyone. We had SuperMILK! and Blurp! Blurp! Lamp in the kitchen. Detergent breaks the protein in the milk causing movement in the milk. 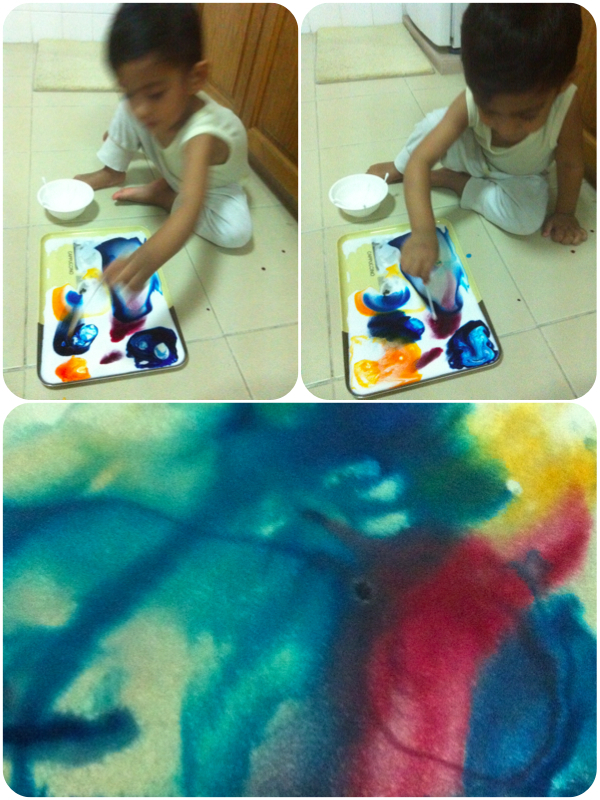 The food coloring helped our lil bubs observe this amazing art. After which, a craft paper is pressed on the surface of the milk and lifted. There, you have it! An art piece to call your own! The kids chose the colors they wanted in their artwork and handled the dropper bottles with their little hands. I used Steradent Denture tablets. The cheapest effervescence tablets I could find. In the presence of water, the acid was able to react with sodium carbonate to form carbon dioxide gas causing effervescence to be observed. As food coloring is insoluble in oil, it will remain as a droplet in the oil and the carbon dioxide will push the food coloring into the oil. 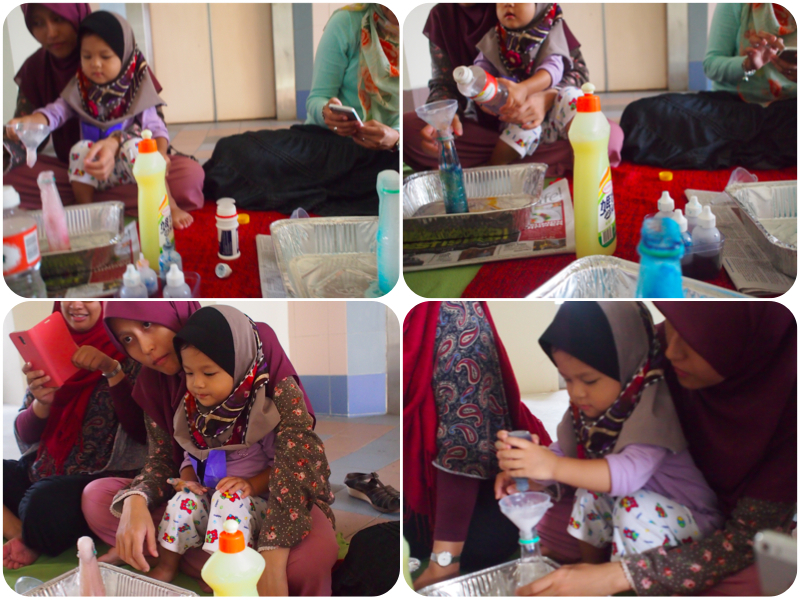 In this activity, the kids poured water and oil using a filter funnel and squeezed the dropper bottles while counting to 20. Amazingly, there was little spillage!! We had a short break for our adorable bubs to have their snacks and play with each other. The last two activities were carried out at the lift lobby. I wanted them to have a change of environment. The main chemical reaction taking place is between sodium carbonate and ethanoic acid (vinegar) which produce carbon dioxide gas as one of the by-products. Detergent and food coloring make the reaction more obvious and fascinating. The kids had SO MUCH fun with this that they finished up the whole bottle of baking soda. Some of them actually started blowing the foam. Again, they had the chance to pour chemicals in using a filter funnel and squeeze the dropper bottles. 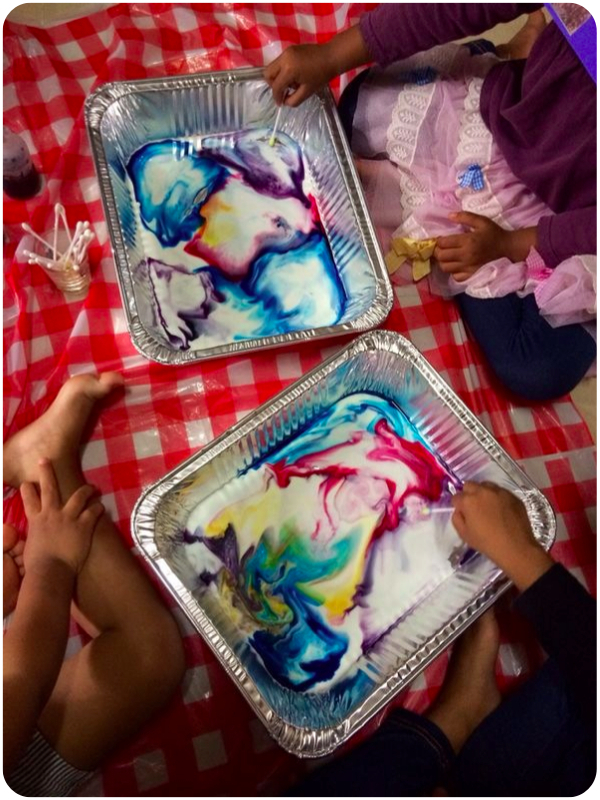 In this experiment, the kids made their own piece of art with the frozen ice-paints. After they were done, they used syringes to mix oil on their piece of art and observed particles in the drying oil. 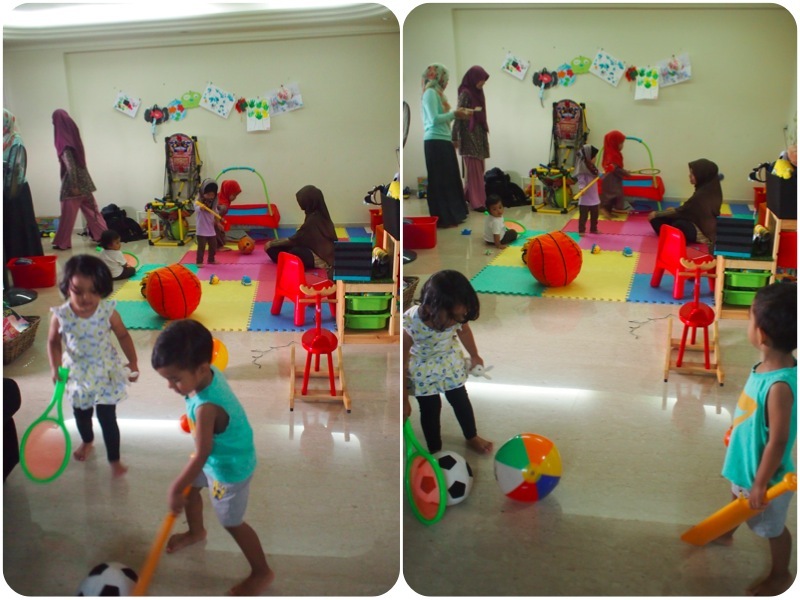 The session ended with my dear mommy friends and the little bubs eating and playing till after Maghrib. I am glad the kids warmed up eventually and participated in my activities but of course, the most eager student award goes to Asha who goes “MEEEEEEE!! 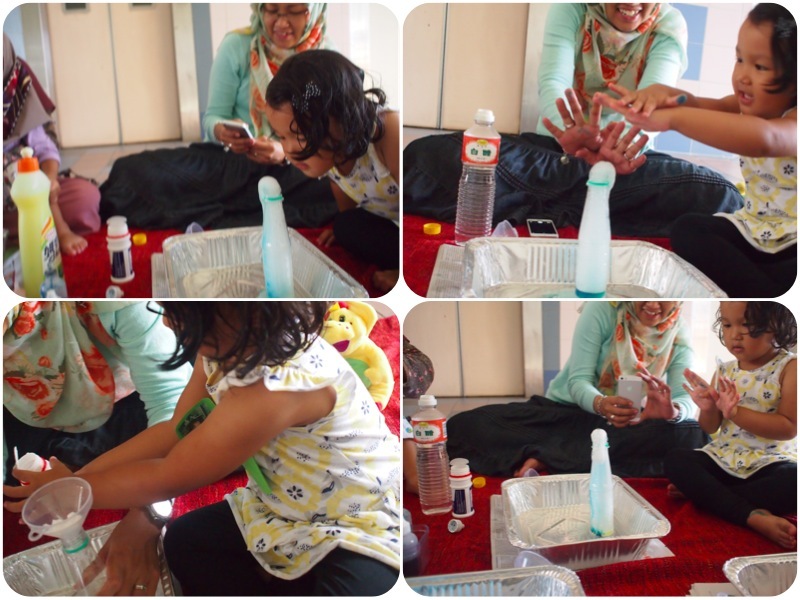 !” every time I asked aloud “Who is ready for the next activity?” 😀 I really admired the kids’ patience in taking turns during the activities, from waiting for the chemicals to reach them to washing their hands. 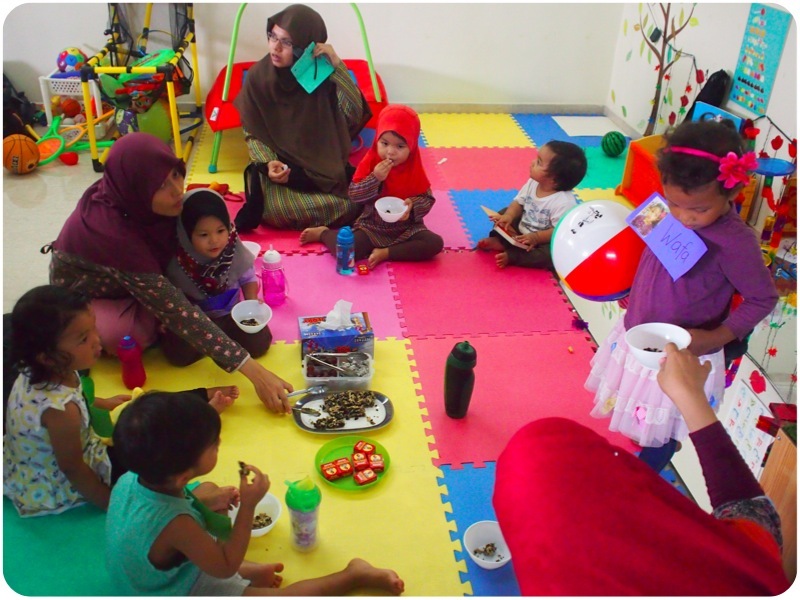 Once again, a big thank you to the wonderful mommies for the plentiful food and also for their time and effort to bring their darling little ones over for the playdate. Not only that, they helped me to clean up before they bid their goodbye. Well, it was definitely an experience for me. Tiring? Definitely! 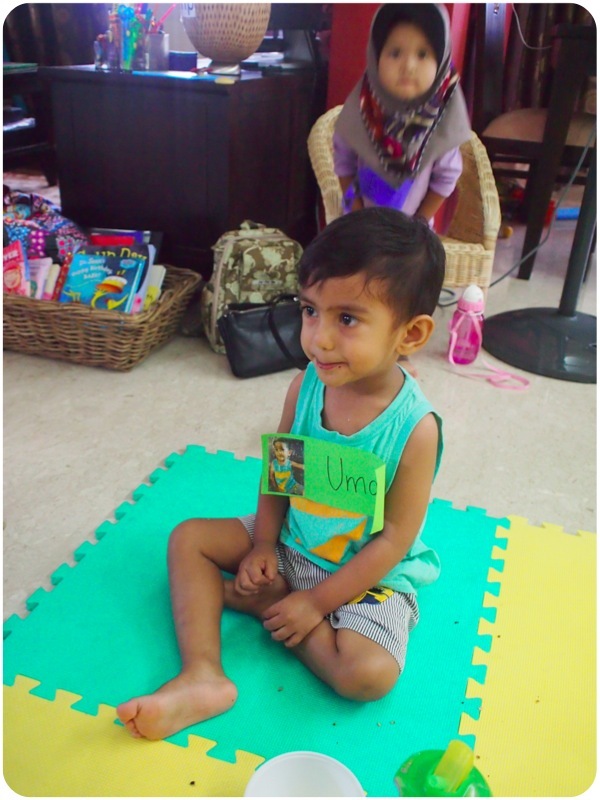 But recalling those smiling and happy little faces I saw, especially Umar’s, definitely made it all worth it! Umar really enjoyed the additional company and I knew it was a day that he would remember and recall from time to time. Will there be a Science Playdate #2 since the name of entry is Science Playdate #1? Truth: YES! I am ALREADY building ideas in my head since the night the playdate ended.